Nossa Cidade (“Our City”), from TheCityFix Brasil, explores critical questions for building more sustainable cities. Every month features a new theme. Leaning on the expertise of researchers and specialists in WRI’s sustainable urban mobility team in Brazil, the series will feature in depth articles on urban planning, sustainable mobility, gender, resilience, and other key themes for sparking more sustainable development in our cities. The hills around Rio de Janeiro offer stunning views, but the infrastructure in Rio’s favelas—or informal settlements—is extremely poor. Because of this, and coupled with its steep and winding topography, the hilly shanty towns surrounding Rio de Janeiro can be very inaccessible. Despite these conditions, more than half of all commutes within these communities are made by bike, signaling just how important cycling is to these areas. 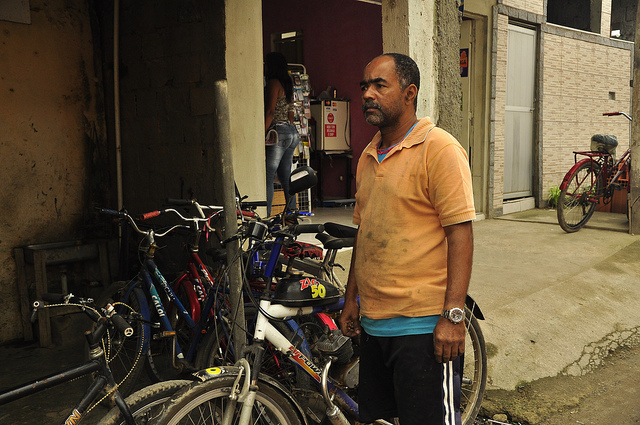 Faced with few transport options, roughly one-third of households in favelas own bicycles, and 57 percent of all trips in these regions are made by bike. For comparison, consider that only 2.4 percent of all trips in the metropolitan region of Rio are via bicycle, despite the infrastructure and incentives in place to support them. With such high numbers, it’s clear that the bicycle is a critical tool for sustainable mobility in favelas. As a result, it has also become a strong element of residents’ cultural identity, giving them a source of mobility and connecting them with neighbors and friends. Therefore, any changes in infrastructure within these areas should take into account how residents use bikes. The challenge is to implement transport solutions that overcome the topographical conditions of these communities while respecting local culture. 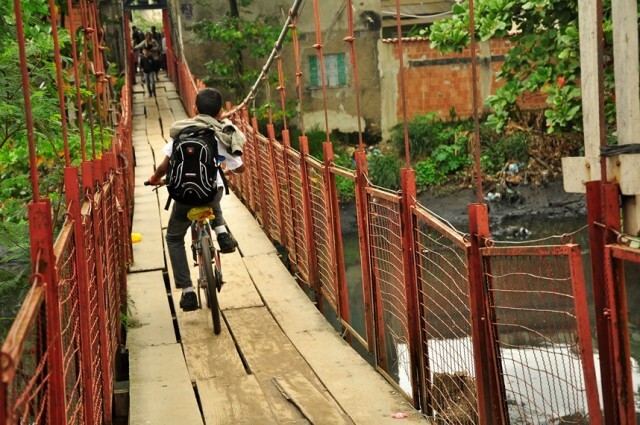 Addressing this need, WRI Brasil | EMBARQ Brasil launched the Manual for Projects and Programs to Foster the Use of Bicycles in Communities. Sponsored by Bloomberg Philanthropies, the project was developed to promote safe cycling within Rio’s favelas. 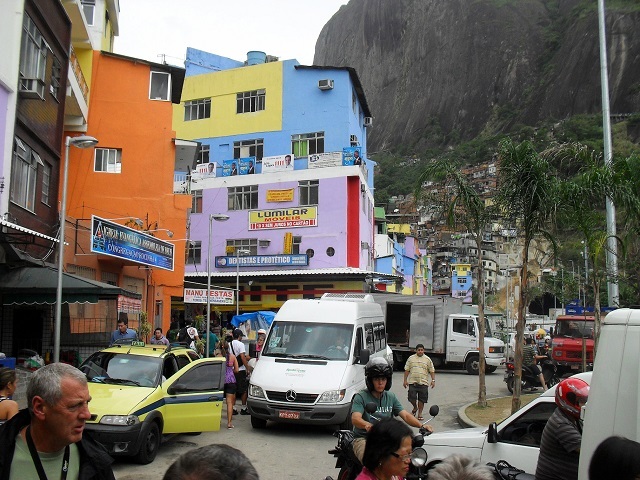 By gathering technical information, the guide provides support for Rio’s Morar Carioca program—a government sponsored project with the goal of revitalizing the city’s informal settlements by 2020. While the publication’s primary objective is to support Morar Carioca, its data and recommendations are widely applicable. “By bringing together international experiences and Rio’s baselines, the manual can be used by any Brazilian city, with just some adjustments to the master plan of each municipality. The purpose of this manual is to help people bike more. By bringing bikes to the people, we can prevent migration to less safe modes, such as motorcycles, for example,” explains Paula Santos da Rocha, Coordinator of Transportation Projects and accessibility of EMBARQ Brasil. The “Win a Bike” program collects donated or discarded bicycles and reassembles them for local communities. Residents in need of a bike can simply volunteer to work in the shop and, after a certain number of hours, are awarded a bike for their efforts. Other than providing quality bikes for locals, the program also educates students on good bike maintenance. For a year, local students are eligible to borrow a bike—if they promise to attend lessons about responsibility, health and safe transport. After the full year in good standing with the shop, the student keeps the bicycle. Rio de Janeiro’s state government has a similar initiative called Recicleta, which upgrades old donated bikes and gives them to working class individuals and recently released prisoners. Some areas in the favelas are either too steep or dangerous to bike, forcing individuals to consider alternatives or simply leave their bike. In order for residents to bypass these problem areas, “Bike on Home” sets up predetermined points for users to pick up and return bicycles. This way, residents can seamlessly move between various modes of transport while always having access to cycling. The program is similar to bicycle sharing projects, but can be either publicly or privately owned. Furthermore, there is no need for new infrastructure, since bikes can be stored in local buildings or existing community spaces. An active bicycling community also presents opportunities to broaden existing public services, such as mail delivery. Post office delivery by bike is already a common practice in neighborhoods such as Copacabana and Leblon, and could be even more successful in Rio’s favelas given widespread bike ownership. Cyclist messengers can deliver both small and large packages by attaching them to the bike. Rio’s favelas may be underserved and suffer from poor infrastructure, but supporting residents’ cycling culture is a way to ensure that citizens living in these areas have greater access to mobility. These programs are only a few ways of establishing reliable transport options for those who need it most: the people of Rio’s favelas. This article was originally published in Portuguese on TheCityFix Brasil.